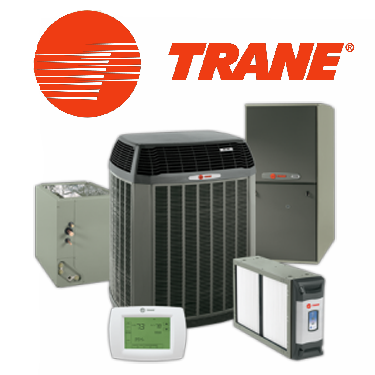 Trane is an industry leading manufacturer of heating and cooling equipment, products and accessories. With a reputation for being engineered to be bullet proof, backed by an excellent warranty and very competitive pricing. Trane owns many patents on their heating and air conditioning products. And Trane thoroughly tests those products to the limit before ever selling them on the market. So if the product doesn’t pass their strenuous testing techniques it will never be installed into your home or business. Trane focuses on innovation, durability and dependability which equates to an extremely comfortable and reliable heating and air system. If you are in the market for a new forced air furnace, a Trane Furnace is the top of the line! A Trane air conditioner is among the highest rated and most durable pieces of air conditioning equipment in the HVAC industry. With superior research and development, attention to detail, solid warranties and efficient operation they are the solution to your air conditioning problems. Our split system air conditioning and heat pump outdoor units all have fully louvered panels to protect the outdoor coil from damage, as well as tough powder paint finishes and weather-resistant screws. We are the only manufacturer to offer the patented all-aluminum Spine Fin™ outdoor coil. Our Spine Fin™ outdoor coils provide greater heat-transfer capabilities, thus resulting in higher efficiencies and greater resistance to corrosion than traditional copper/aluminum coils. Our XL20i model is among the highest SEER ratings (cooling efficiency) systems in the industry. Trane's gas furnaces feature self-diagnostic controls, a heavy steel 40-inch-high, insulated cabinet, hot surface igniter, multi-port in-shot burners, one-piece heat exchangers with no welds, durable pre-painted finish, and some of the highest efficiencies in the industry, making Trane an obvious choice. This reliability and efficiency extends to our line of top performing All-in-One systems, packaging all your heating and cooling needs into one sleek cabinet for versatile installation. We are also the variable-speed airflow experts. Our variable-speed furnaces and revolutionary Hyperion™ air handlers can do things other manufacturer's products can't, such as superb humidity control with Comfort-R™. This feature allows the coil to get cold faster and the furnace blower to slowly ramp up and down, or to operate at 50 percent of cooling speed in the “Fan On” position. This provides greater air circulation and filtration, even temperature distribution, humidity control, and quiet performance. Variable-speed motors are the most efficient motors as well, increasing the overall efficiency of your heating and air conditioning system. And when it comes to cleaner air, our revolutionary Trane CleanEffects™ is the industry's most effective whole-home air filtration system, capable of removing up to 99.98% of the allergens and harmful particles from your family's air.